Keen to see the Great Pyramids during a layover at Cairo Airport? Make the most of spare time between flights with this Giza Pyramids and Sphinx tour. Meet your Egyptologist guide at the airport, and travel by air-conditioned minivan to Giza as your guide points out Cairo’s highlights on route. 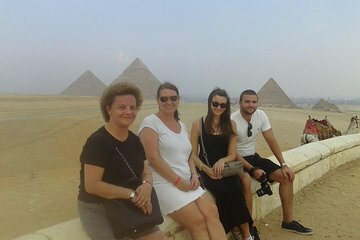 Ogle the three mighty pyramids on the Giza Plateau, enjoy a camel ride, and see the Great Sphinx and ancient Valley Temple ruins. After lunch at a local restaurant, ride back to the airport in time for your departure flight.